You are currently browsing the tag archive for the ‘nursery barn’ tag. The nursery remodeling pro ject took on a new look as Dale removed the siding from the attic end of the barn to create a smaller airspace for the building. Since the new nursery is only a small portion of the larger building, it would work best to create a smaller attic space to draw the air from into the room. If we didn’t, then we’d be drawing hot or cold air from the whole building into the nursery. So Dale removed the siding and then put a wall in the attic to downsize the area. As the weekend drew to a close, the urgency to close the building back up increased, so Dale and the boys worked extra hard to get the siding back in place. 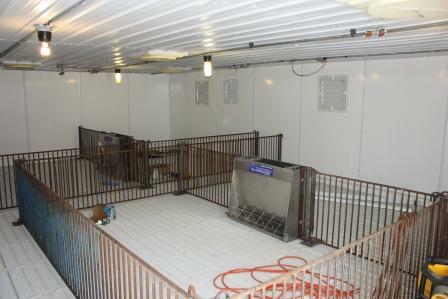 As you can see by the picture, the gating and pens are in place. We are waiting for the cement guy to come and pour the pads for the bulk bins, which will then allow us to put in the feed lines. If pigs need to go into this building before that’s completed, Dale can always hand feed the pigs. It’s been interesting to watch this project progress but I know that Dale is anxious to have it completed. Harvest has been taking up a large portion of his time and before we know it, winter will be here. Slats and Floors and Walls, Oh My! 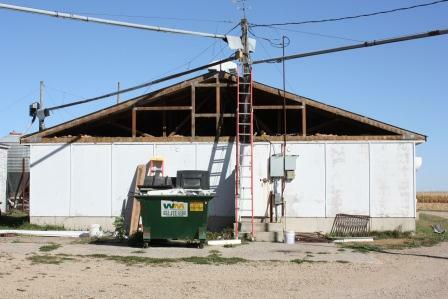 As you can see by the picture, the remodeling project is creating a new look in the barn. Dale and the boys have been taking out the old slats and replacing them with plastic flooring. This flooring will be warmer and better suited to the young pigs. 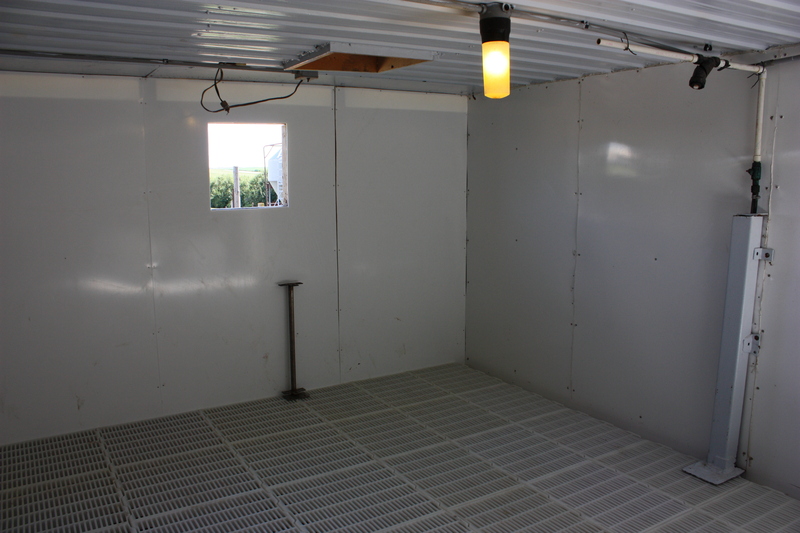 Dale also put sheets of hard plastic on the walls which provides better insulation and easier clean-up. I would describe their pace as slow and steady. “We got 12 slats out today!” seemed to be a rallying cry. Of course I tease the boys about how hauling slats is building their muscles and what the girls might be thinking. They roll their eyes since there are no girlfriends yet; but I do believe their muscles are growing. to the realization that my deck, which was to have been the next project after this nursery, will have to wait until next year.